So, I’ve been searching for a casual fall coat for quite a while now. I wanted something that would be good for taking the dog for a walk, running errands or going to a football game. Something that would keep me warm and dry while but not too technical or sporty. 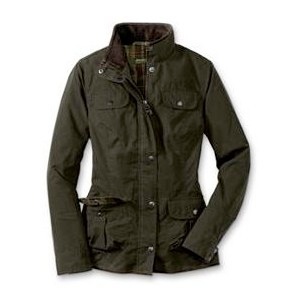 I’ve been pretty envious of Shawn’s Barbour waxed cotton jacket, but thought that it was way too manly for me. It has that barn coat cut that is not, um. . .flattering in the chest area. I look like I’m trying to hide a country ham under there or something. Anyways. . . I’ve been searching high and low and was super happy to discover a feminine version of his coat done my Eddie Bauer. Now, I haven’t really thought about EB since the late 80’s, but I have to admit those guys have made a real turn around the past couple of years. But, I saw this coat in one of their catalogs and thought it might be just what I’m looking for. Made out of waxed cotton, it is durable, water repellant and wind resistant. The olive color is on trend while still classic and the cut is much more flattering with it’s front darting and adjustable waist tabs. I know that this is going to end up being my go to jacket for this fall and many more to come.